"Knight's Endurance Pack" includes infiltration uniform and upgrades. 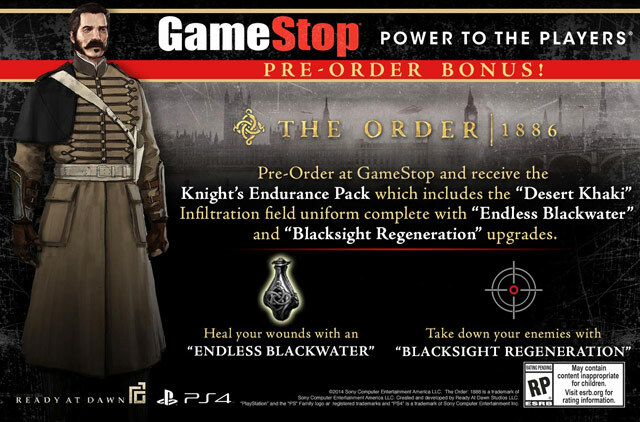 Consumers who pre-order The Order: 1886 at GameStop will receive the “Knight’s Endurance Pack,” GameStop announced. The Knight’s Endurance Pack includes the “Desert Khaki” infiltration field uniform, as well as the “Endless Blackwater” and “Blacksight Regeneration” upgrades. These pre-order bonuses are in addition to the previously announced “The Knight’s Arsenal” downloadable content, which includes alternate Knight uniforms and powerful variant weapons that can be equipped after the game is cleared. The Order: 1886 is due out for PlayStation 4 on February 20, 2015.